The benefits of iodine in the body are far reaching. Oddly enough, it is the least understood of all the essential trace elements. This is the safest of all the essential trace elements which can be administered in large amounts when in an inorganic nonradioactive form. Iodine is stored throughout your entire body – the skin, teeth, nails, all the organs, and bones. Cherry angiomas are red moles on your skin which contain an abnormal amount of blood vessels. These can be extremely small and less than 5 millimeters or can grow larger. They are considered to be painless and harmless. Coloring can be from red to purple, often dome-shaped and may be located on the trunk, limbs, face scalp, neck, but rarely the hands. 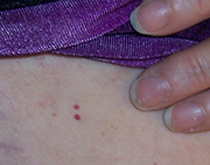 These skin lesions are extremely common. Sometimes, they may appear as clusters of dilated capillaries on the surface of the skin or may appear alone. Here is a photo of some of the red moles I have on my skin. Most physicians and medical information would have you believe these skin lesions appear in mid to late adulthood. However, the latest statistics report that ninety percent of women have this condition. Of that percentage, eighty percent are women under twenty years old. Unfortunately, this condition is now appearing on babies and young children. Some doctors believe this is sun damage to the skin. Some believe it is a genetic malfunction. They fail to fully address the question of why this skin condition is happening. There is no guarantee any of these are a permanent cure. Sometimes additional treatment is needed. Still, this does not address the underlying cause. 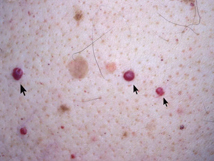 Cherry angiomas are caused by bromine poisoning. Research conducted by Drs. A. D. Cohena, E. Cagnanob, and D. A. Vardya, shows the correlation between bromine poisoning and cherry angiomas. Mysterious red moles appeared on researchers’ bodies after working for extended periods of time with brominated compounds. 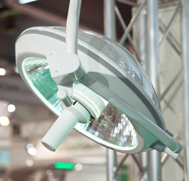 Bromine poisoning, stored in the fat tissues, is a halogen. It is a known disruptor which prevents the absorption of iodine in the body. Additional products containing polybrominated diphenylethers (PBDEs)can be found at The Environmental Working Group.